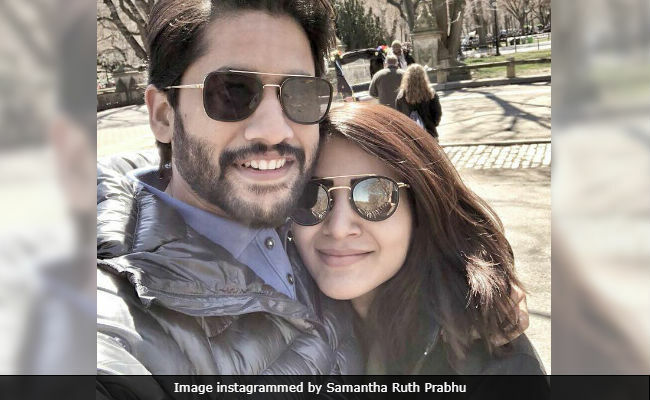 Samantha Ruth Prabhu is not a fan of taking selfies but she had to oblige when it was with her husband Naga Chaitanya and because they were at Central Park, New York, "Where it all began... eight years ago." Samantha and Naga Chaitanya fell in love while shooting their first film Ye Maaya Chesave, parts of which were shot in Central Park. Samantha instagrammed a picture and wrote: "Usually hate selfies but this had to be done. Central Park, where it all began... 8 years ago. Thank you, for the magic. Just had to come back and say Thank you." She shared the post with some adorable hashtags such as #whatsmeanttobewillbe #lovewillfindaway #chaylove #happilyeverafter. After Ye Maaya Chesave, Samantha and Naga Chaitanya co-starred in Vinnaithaandi Varuvaayaa, Thrayam, Autonagar Surya and Manam. Last month, Naga Chaitanya announced that they will soon collaborate for a Telugu film, which will be their first film together after marriage. Samantha and Naga Chaitanya got married in October last year in a lavish ceremony in Goa. Meanwhile, Samantha has been a part of several hit films post marriage, the first of which was Raju Gari Gadhi 2 co-starring her father-in-law Akkineni Nagarjuna. She also featured opposite Vijay in last year's superhit film Mersal. Her new film Rangasthalam, with ram Charan, is currently winning the box office. Samantha's upcoming projects are Mahanati, releasing in May and Seema Raja, Super Deluxe and Irumbu Thirai. Naga Chaitanya is looking forward to the release of Savyasachi and Sailaja Reddy Alludu.